Our tour guide was profoundly apologetic this morning as we switched to yet another bus company. It seemed that our group name had been misspelt as only a Japanese company can do. Rather than be annoyed, however, we were absolutely delighted, and many people took photographs of the erroneous sign for posterity. I have reproduced my own below. 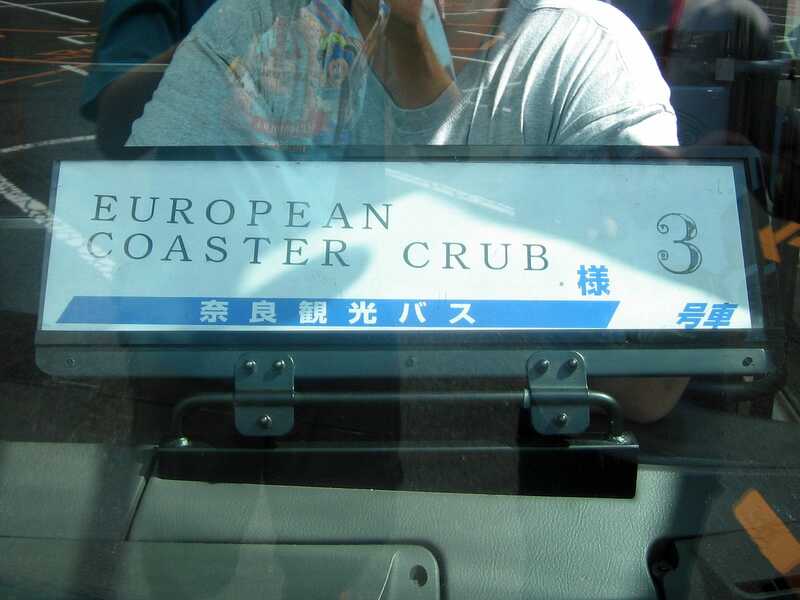 Since this trip the name Coaster Crub has become a semi-official one, with people holding up signs bearing that name in the airport. Go figure. Occasionally my travels bring me to a ride that has all the characteristics of a roller coaster, but stretches the usual definition in different directions. Slope Shooter (#655) was my first encounter with a coaster made out of concrete, and while I understand there to be other ones it presents me with a dilemma; my coaster database only supports two types of track, so for the present I'm going to categorise it is a steel tracked ride. Not dissimilar in layout and design to the one earlier this trip, this coaster can best be described as a car running in a log flume trough with no water. There are kicker wheels in a few places and wheels on the side of the car to allow the vehicles to turn corners. The major coaster at the park is Jet Coaster (#656), a nice family sized ride with an interesting layout and a decent turn of speed. It was a great deal faster than the dull and boring powered ride, Bear Coaster, which could best be described as a waste of ride tickets. With all the coasters complete, I couldn't resist a second go on Slope Shooter, and as there was no rule against cameras I decided to film the entire ride for my archives. My footage is a little shaky due to the not entirely regular movement of the cars, but I was nonetheless happy with how it came out. Don't get mad; get even. By the time I'd escaped the wheel it was almost time to leave, but before departing I found time for one more go on the Slope Shooter and a quick pass through a Walkthrough attraction whose name was only available in Kanji. The latter was a crooked house style building; not a particularly good one, but an interesting diversion nevertheless. No trip planner is infallible. I've made some pretty spectacular blunders in my time, and no doubt they'll happen in the future. 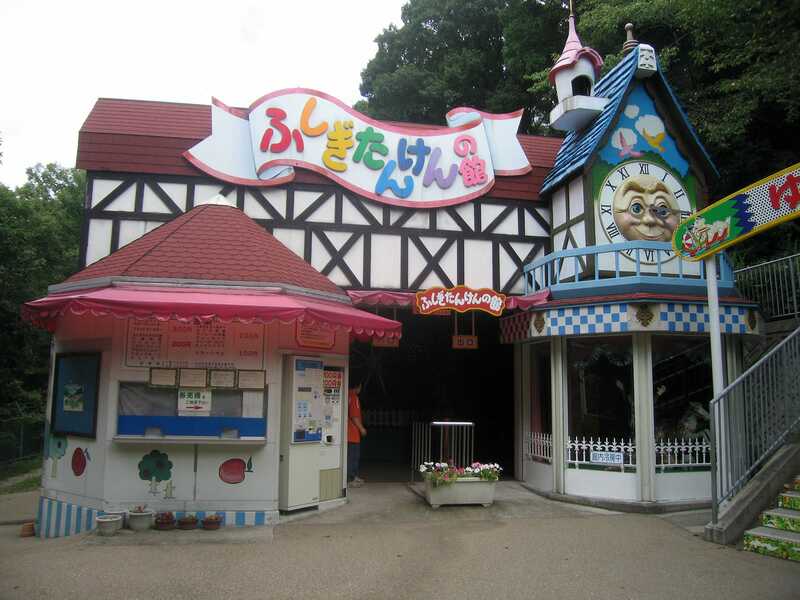 However, it falls to this diary to question what the organisers were thinking when they arranged a trip that involved several hours travel in the middle of a potential park day, which subsequently put us at Fuji-Q Highland less than ninety minutes before closing. Predictably, the queues for the two major coasters had already been closed for the night, so we were left with only the smaller attractions to chase. As it was we only had time for two rides, but given that we were using individual tickets that totalled ¥1300 it's probably just as well. The first of these was positively awful, and there's nothing good that can be said for it at all. Zola 7 (#657) began its journey with a mediocre target shooting dark ride with almost completely non functional guns. Three of us in the car managed to hit a combined total of just seven targets in almost two full minutes of animatronics. Then, with the dark ride out of the way, we were dropped into about ten seconds of brutally rough coaster. In summary, the experience could be considered a complete waste of time and money. Mad Mouse (#658) was only marginally better. It had a unique and interesting track layout, but was marred by cars that had all the turning ability of an average shopping trolley. After a few hard slams in the side I had had enough, but there were still several more to go. It was, to say the least, not a ride I had any desire to try for a second time. The other two minor coasters were both closed by the time we got to them. 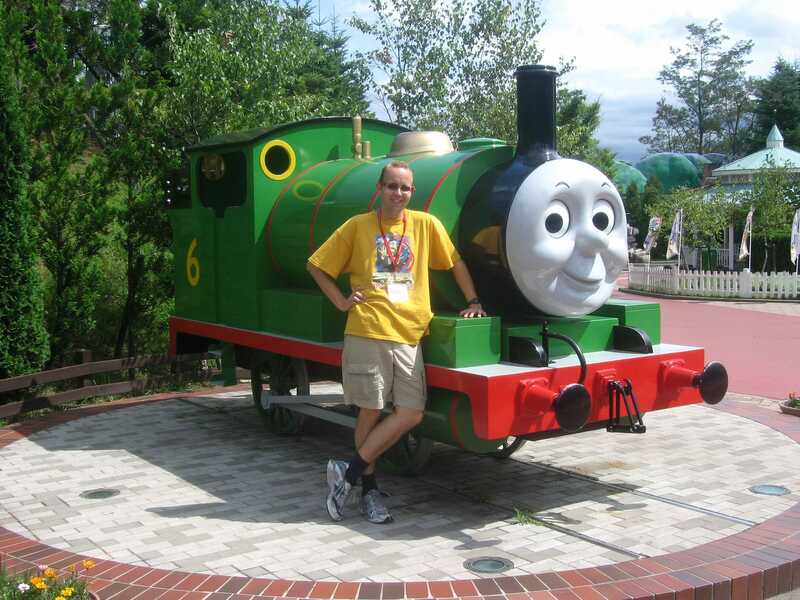 The entire children's area, incorporating the strange kiddie coaster with Thomas the Tank Engine trains was deserted; perhaps it closed before the park. Either way, we were left with four coasters to hit in only a few hours tomorrow; with luck it will be possible to do that. There is a little postscript to this story. I decided to pay the extortionate ¥1500 charge for Internet access in the hotel so I could publish up to date trip reports. This fee turned out to be for the loan of a DSL modem with Ethernet port. On paper at least using technology like this seems like an extremely sensible way of making broadband available in a hotel that wasn't built with the cabling in place. Ufortunately, there was a catch, namely that the modem they provided was not able to obtain a line sync in my room. The helpful staff insisted on running through everything carefully, and my non-existent Japanese was insufficient to make them understand that the absence of a line sync meant that there wouldn't be any connection in my room. In the end, I gave up altogether and asked for my money back.